The AAU Mr. America had a long history and was first held on 4 July 1939 where the winner was named “America’s Best Built Man”. In 1940 this was changed to what is now known as the Mr. America contest. The event was won by all of the greats from Grimek, Reeves, and Pearl down to Joe DeAngelis in the ’90s. The AAU Mr. America was a prestigious bodybuilding competition started by the Amateur Athletic Union (AAU). It had a long history and was first held on 4 July 1939 where the winner was named “America’s Best Built Man”. In 1940 this was changed to what is now known as the Mr. America contest. The event was won by all of the greats from Grimek, Reeves, and Pearl down to Joe DeAngelis in the ’90s. The 1984 Mr & Ms America Contest was held on September 1st, at the Pasadena Civic Auditorium in California. Over 70 men competed representing 25 states. In the hotly contested Overall Posedown, Joe Meeko came out as the judges’ choice for AAU Mr America for 1984. For the women it was Jill O’Connor who came out as the outstanding Overall Winner. The 1984 Overall Winner was JOE MEEKO with a superbly proportioned and shredded physique. Joe then went on to the 1984 NABBA Universe where he placed 2nd in the Medium Class. 1987 Overall Winner at the NABBA USA Nationals. 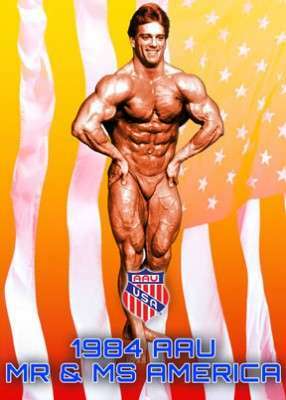 1988 Overall Winner at the AAU Mr. Universe. This video was supplied to us under license by Joe Meeko to celebrate and perpetuate his record as winner of the 1984 AAU Mr America title. Our thanks to Joe and the video producer.